It’s fair to say that the majority of my December, as a professional magician, is entertaining at Christmas parties. And most people think that once Christmas has gone it’s a case of putting my feet up for a week before next leaving the house for New Year’s Eve. Although that can be the case, over the last few years I’ve found that I get booked more and more for events in that period between Christmas and New Year – and many of those bookings are for me to entertain at weddings. Indeed, during the last week of 2018 I plied my magic at three different weddings. One of these weddings was the marriage of Phillippa and Andy. I first met them at a wedding fair at Wokefield Park in Berkshire, and soon after that they contacted me to make a booking; but not for their wedding, but for the Christening of their son. On that occasion I mingled with the guests following the service, and the magic was so well received when they started planning their wedding they thought it would be a great idea to book me to entertain. The wedding was at the fantastic Moor Park Golf Club in Rickmansworth, London. The main building is an imposing building fronted by towering pillars. To say it was atmospheric on a frosty December evening as a light fog covers the surroundings would be an understatement. It was great to see some familiar faces when I started performing, and many recognised me from the Christening. As more evening guests arrived there were guests arriving who hadn’t been at the Christening, so it was great to interact with them as well. 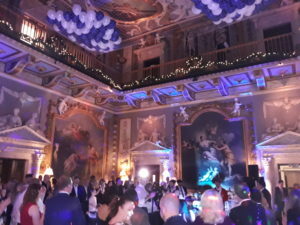 I took a little breather whilst there was the first dance, followed by fireworks; but whilst the band (and later disco) blasted away in one room I continued to mingle in the bar and seating areas (and at one point even in the corridor leading to the toilets). Despite being there for over three hours I didn’t get to see much of Phillippa and Andy as they were busy catching up with friends and family, but fortunately they didn’t miss out completely. If you would like more information about how I can entertain the guests at your wedding please drop me an email: robert@robertbone.co.uk.